I've read a similar guide like this one on the Future Combat forums, and decided to re-write it for the Kingdoms at War users. I hope this guide will help out everyone that needs it. Enjoy reading it! First of all, let's learn some basics, such as changing the titles of members within your clan. The owner or the admins can do this (although only owners can change admin titles). What we need to do first is go to the List of Clan Members (circled below) and tap it. Find the member who's title we are going to change. Scroll down the roster until we find the player. Next to the player's name we will see a button which says "Manage". You will come to a page which looks like the one below. 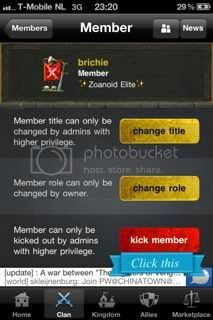 Tap the button which says "Change Member Title". 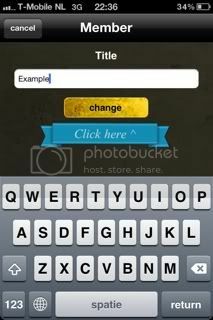 Type then desired title into the text box and press the "Change" button. YOU HAVE SUCCESSFULLY CHANGED SOMEONE'S TITLE (LOL)! 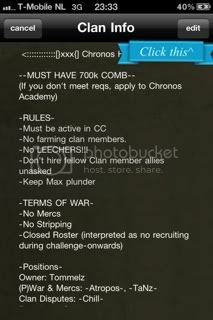 I will show you how to declare war on enemy clans. NOTE: Your clan must not already be in a war, or an upcoming war. First of all, we'll need to go to the opponent's clan page. Press the button just below your clan's name. Click on the "Find Rival Clans" button and search for a suitable rival clan to fight. This will bring you to page similar to the previous. You should be very carefull on who you declare war against. Once you've declared and the enemy accepted, it's on. 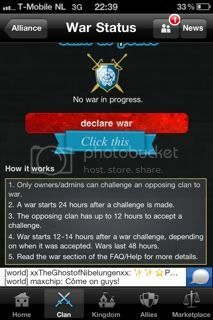 You are able to forfeit a war after the 24 hour mark on the war clock. A plunder war has two sides, like any other war. There’s a side with attackers, and a side with OSFs. The attackers will gain ‘free gold’ by attacking an OSF. If you’re in a plunder war you’ll always have to carefully read the Clan Announcement in order to know which OSF is open for attacks. If you attack the wrong player you might get in to problems. At the end of a plunder war the attacking side will forfeit, and the OSF gets the tax, so they get a part of the profit aswell. This is actually called a reverse plunder war but it’s the most common plunder war in the game. A real war has attackers and spies on both sides. A war like this is what this game is all about. It’s very simple: The winner gets the pride and the tax. In a friendly war the leaders of both clans usually make a few deals to be sure to get a ‘fair fight’. This will be done in Matched rosters(=Stats of both clans will be relatively equal) and locked rosters(=Nobody will be allowed to join the clan after this deal is arranged). Of course there’s many rival clans in this game, who will not agree with terms for a friendly war. Wars like this usually contains a lot of mercing(=Inviting as many strong people as possible whilest warring). Not to forget there’s a great chance of stripping(=Buying all his/her allies and keep hitting him to drain all this players gold/pots) someone in a war like this. Go back to the Main Clan Page! Click on the "Manage" tab. You'll arrive at a page similar to the one in the picture (it will look different depending if you are an admin or an owner). Press the "View Applicants" button. This will take you to a page which shows you the names of the players that applied. Depending on whether you want to accept or decline a player, you will have to press the corresponding buttons. The "Accept" button is pressed if you would like to let the member into your clan. Press the "Reject" button to deny the player of delicious cake and fulfil your mildly sadistic desires. 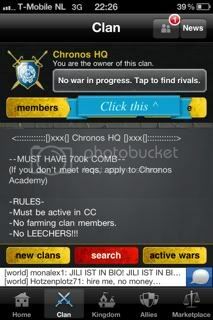 To kick a member, go to Main Clan Page and tap the "Members" button again. Scroll down the list until you find the player you wanna kick. Press the "Manage" button next to their names. You will come to a page similar to the one below (will look different for Owner/Admins). Tap the "Kick" button and wa la~ he falls face down. Remember! 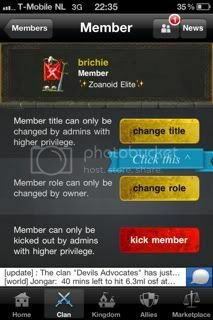 Only Owners can kick Admins. To disable join requests, go to the Main Clan Page again. 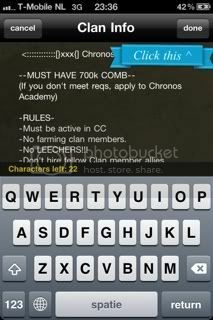 Now tap the "Disable Join Requests" button and this will stop people from applying to your Clan. To edit your clan's description/info, go to the Main Clan Page again. Tap the "Edit Clan Info" button. Change what you want, and when ready, REMEMBER to tap the "Done" button. Go to your Main Clan Page and tap the "Members" button. 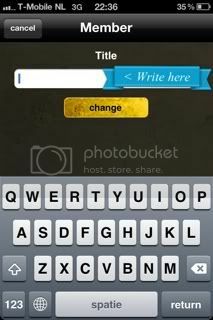 Find whom you want to promote/demote, and tap the "Manage" button next to their name. 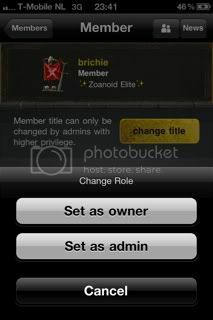 Tap the "Change Member's Role" button. Note that you should only give admin status to a person you trust, and not just because this person is strong. With power comes responsibilities! It won't be the first time a clan got destroyed because a clan owner trusted another player to quickly! Go to your Main Clan Page and tap the "Manage" button. 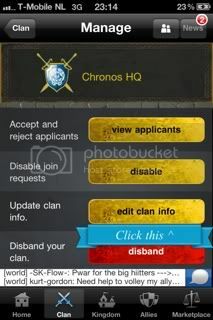 Once you disbanded your clan you can't get it back. 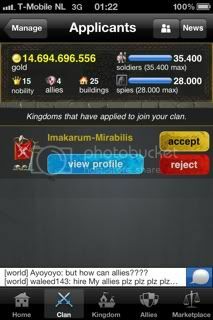 You'll have to buy a new clan for 3 billion gold or 100 nobility points, so be absolutely sure about it! 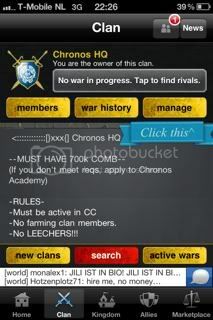 (Funny) fact about clans: You’re only able to have 100 people in you clan, exept the two clans called iG and Foxes. 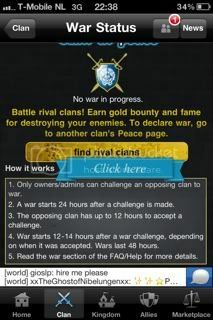 They’ve been rewarded an extra 20 member slots in their clan, as they participated in a beta test of the war system. Thank you for reading this guide all of you who have taken the time too. Feel free to post any comments or questions that are related to this thread below. Also, I'd like to thank my dear friend Abyssus for helping me with this guide! Last edited by Tommelz on May 8 2011, 12:15pm, edited 45 times in total. Tyvm for the positive feedback! @Warrior; I've read your guide aswell, and it looks great. Thanks Shadow. It isn't something every new player knows about tho, so it's usefull for their future use. Make sure you make Outdoortoast an admin if your clan!